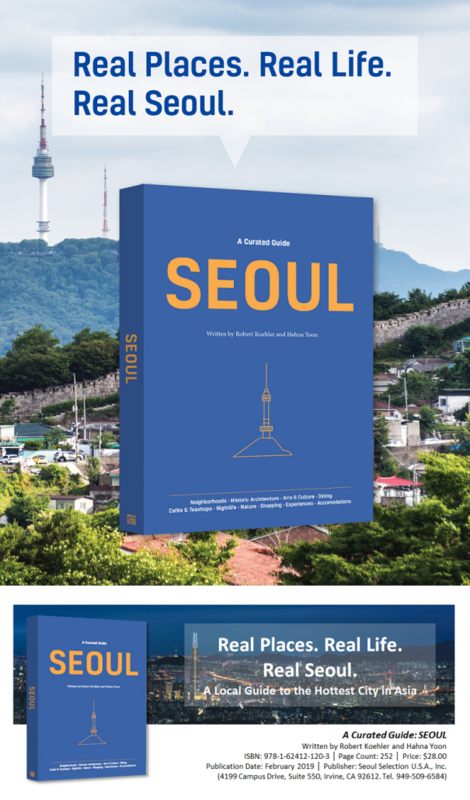 A new English Seoul guide book <A Curated Guide SEOUL> is coming out soon. Please wait a just little longer. and from February or March in the US and foreign countries. 새로운 서울 가이드북 <A Curated Guide SEOUL>이 곧 출판됩니다. 국내에서는 1월 첫 주부터, 미국 등 해외에서는 2월말 혹은 3월초부터 유통, 판매될 예정입니다. https://magazine.seoulselection.com/wp-content/uploads/2018/12/서울가이드북_블로그홍보이미지_1228.png 1358 798 daniel http://magazine.seoulselection.com/wp-content/uploads/2018/01/Seoul-logo.png daniel2018-12-31 16:23:552018-12-31 17:11:48New Year, New SEOUL is coming out soon!